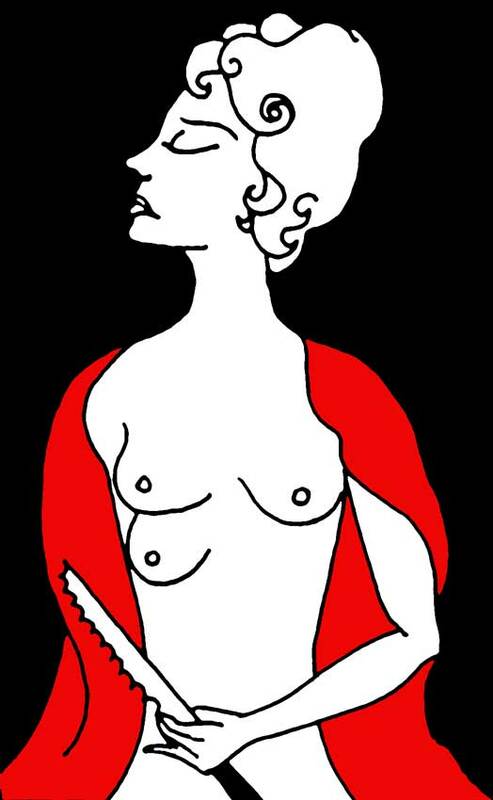 Woman with a third breast and a bread knife. I grew a third breast the other night. Just under my right breast. It swelled up and started to weep. White fluid dribbled down the sides and left a flaky dry film around the base. It was silent but carried on weeping. A waste of milk. What was I to do about this lump on my body. It wouldn’t stop whining, it wouldn’t stop dribbling. What an embarrassment! It was 5 in the morning now. I couldn’t get back to sleep. Slowly I got out of bed and reached down to the satin dressing gown I’d flung across the floor last night. I was careful not to catch a glimpse of my naked body in the full length mirror. Perhaps the thing would fade away in a while if I ignored it. But within no time there was a large damp patch on my right side and warm fluid running down my flesh. As I moved into the kitchen, the intention being to make myself a calming cup of tea, the smell of stale milk arose from beneath the dressing gown. What could I do? I had no choice. A knife was required. I found my large bread knife in the kitchen sink, rinsed it off and wiped it down. I wasn’t sure how much this would hurt me, I imagined a lot. A minute or so went by as I stopped to consider my action. The breast didn’t relise what I was intending, it was still hidden under the dressing gown, and besides it had no eyes as far as I could see. Admittedly I hadn’t inspected it much, I was too appalled by the sight of it to poke around. Perhaps, I thought, knife clutched in one hand, dressing gown clasped tight together in the other, perhaps I could remove it some other way. Ease it off somehow, like butter off a plate on a warm day. Or talk it into disappearing. Surely it realized how unreasonable it was being? Here I am ripe, flourishing, near the very peak of my existence yet with so much more potential, I cannot be expected to put up with this third breast. This vulgar personality haunting my every move. If only I could reason with it, make it see how it should cease to exist under the superiority of ME. Slowly I open the dressing gown and looked down. Like Dorian Gray at the moment he sees his portrait I am confronted by a hideous version of myself, my body transformed, mutated around this third breast. It sits there near the middle saying nothing, just oozing milk. I raise the knife tight in my left hand, grasp the third breast hard in my right, and with a half growl half scream I force the knife through my flesh and down through the third breast. The pain is horrific, blood and milk race each other across my limbs. I feel sick. The breast is hanging now from a thread of skin. I take a deep breath and saw through the thread with the bread knife. It falls as a lump of fresh cut meat to the floor. I slump down next to it in a puddle of blood mixed milk. The breast is still just about alive, it is making very quiet gurgling noises and every now and then it quivers. Using a tea towel I pick it up and place it on a clean plate. I place the tea towel over the top of it. The fridge is close to me. I open it. There is space in the plastic draw in the bottom. I clear out the remaining old vegetables and place the breast on its plate inside the plastic draw. I leave the tea towel on top. Close the draw carefully and then the fridge door. Very very quietly I mop the floor with my other tea towel, throw it in the bin, then creep back to bed. I sleep very deeply and do not dream. Since that morning I do not dare look in the plastic draw in the fridge. Occasionally I hear noises coming from it. I know the breast is still alive, but only just, it can’t harm me now. Next Post The Strange Incident of Stanley Bad – Episode 1. This is very disturbing stuff – dark and something deeply wrong… is this working at the liminal? the cusp. seems to have lots of meanings, some i don’t really want to figure out. The fact it’s in the first person makes it really powerful.